There are 4 friendship bracelet knots. Once you know how to make all 4, with a little practice, you can easily make any string friendship bracelet. The backward knot. This is the second knot you need to learn. 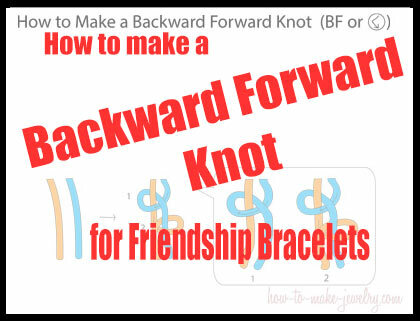 When you know both the forward and backward knot you can make many beginner bracelets. The backward-forward knot. For this knot keep on reading and you will learn how to tie this knot easily and quickly. Question: When do you use a backward-forward knot? All joking aside, it's true that unless you are a friendship bracelet designer, you will be following friendship bracelet patterns, or videos, or some other kind of instruction. If you are a friendship bracelet designer, you have probably mastered all the knots and know when to use them just through experience. If you still need to know when to use this knot, here's the real answer. 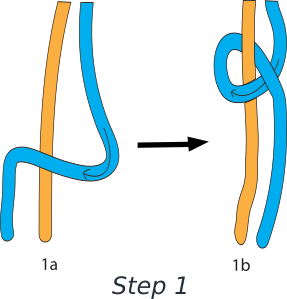 The backward forward knot is used when you need to make a knot with you right hand string, but you don't want the strings to switch position. This depends upon where you want the strings to be in order to be set for the next row. Again, you would only know that if you were designing a pattern yourself. I suggest you make a bunch of bracelets following some kind of instruction before attempting to design an intricate pattern of your own. 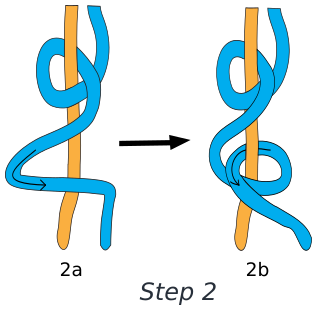 The backward forward knot is the reverse of the steps of a forward backward knot. Not only that, but if you already know the forward knot, and the backward knot, you can easily make a backward forward knot. 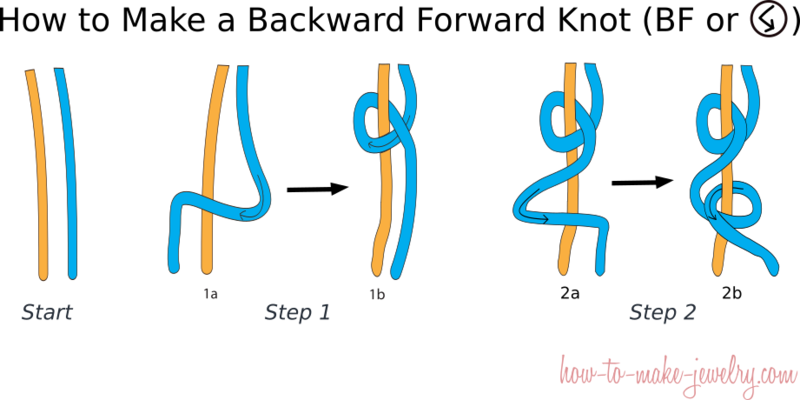 It starts with the first step of the backward knot and ends with the first step of a forward knot. See how it all works together? Or does all this make it sound more confusing? Don't worry, just follow along step by step. It's easy. At the start you will have many strings, but I'm just showing you the 2 working strings in the diagrams. Just imagine the other strings are there too. Step 1: Using the right hand cord, loop it over the left hand cord to make a "P" shape (see 1a). Then reach through the "P" loop and grab the tail of the same string and pull it through the loop. Pull the string up to tighten. Step 2: Using the same cord, make a shape like a number "4" with the right hand cord passing across the left hand cord (see 2a). Reach your fingers through the loop of the "4" and pull the string through (see 2b). Tighten the cord by pulling gently upward. Your cords should retain their original positions. Your backward forward knot is finished.